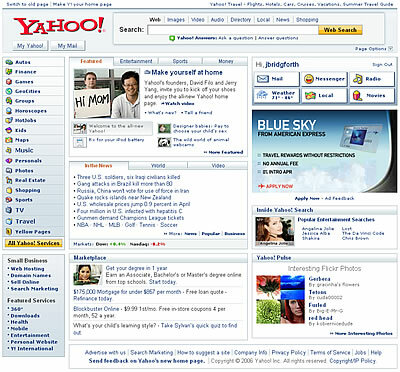 Yahoo has a new look for their homepage. You can preview it at yahoo.com/preview. I like how they are using AJAX to make the page interactive and to change the content in the first “box” (with headline, ‘Make Yourself at Home’) without the page refreshing. When you click on the four different tabs, different content comes up in the box. It gives me some inspiration of how I could highlight different content for GodSquad.com. I would like to learn how to do this.